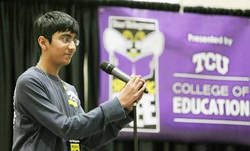 Narahari Bharadwaj, 13, correctly spelled "dolorous" and "enthalpy," earning the right to advance to the Scripps National Spelling Bee competition June 1 and 2 in Washington, D.C.
national competition in Washington D.C. in June. Growing charter public school system showcases students’ achievement in science, technology, engineering and math at 2nd annual robotics competition; 28 Harmony campuses across the state of Texas competing. Dallas/Fort Worth Metroplex, TX, March 3, 2011 -- Harmony School of Nature & Athletics will host its 2nd Annual Harmony Robo-League competition. Harmony Public School students from across the state of Texas will compete by pitting their technological know-how, teamwork, and presentation skills against other campuses.